Vapor DNA carries the authentic Joyetech Elitar 75 e-pipe at a discounted price. 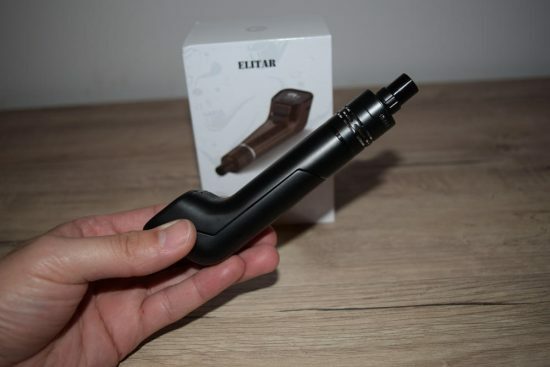 The Joyetech Elitar 75 is an electronic pipe, or e-pipe that features an elegant design inspired by the classic tobacco pipe, but comes loaded with all the high-tech features of an advanced vape mod. 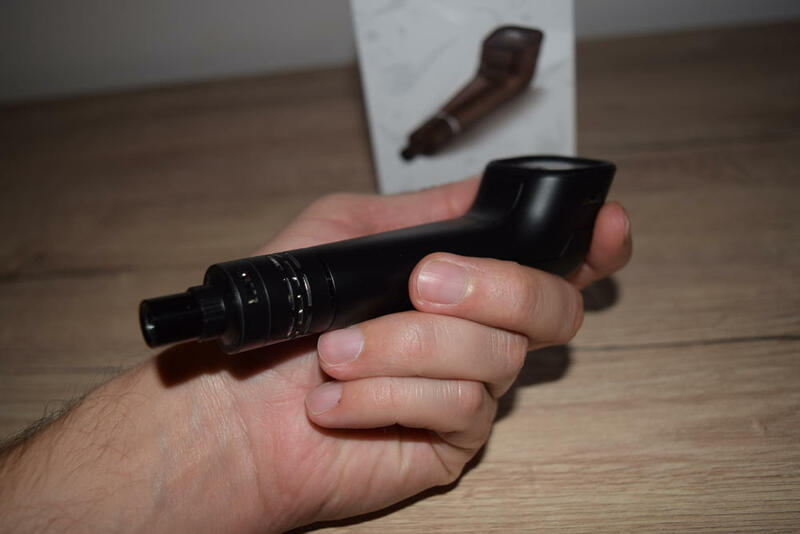 So if you find yourself sitting in your favorite rocking chair and craving a few puffs on the old tobacco pipe, an e-pipe like the Elitar 75 is probably your best tobacco-free alternative. 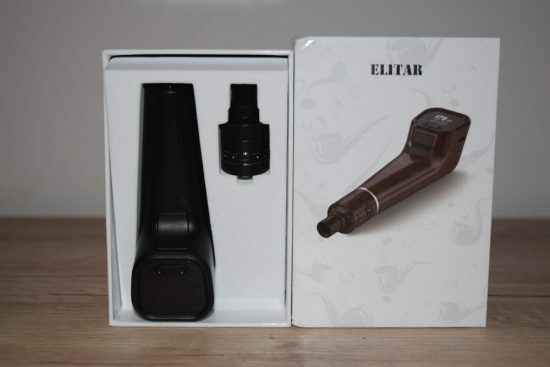 The Elitar e-pipe kit comes in a large white cardboard box with an image of the device on the front and the list of contents on the back. Inside the box, you’ll see the Elitar itself placed in a foam holder, right next to an included cup-style tank. 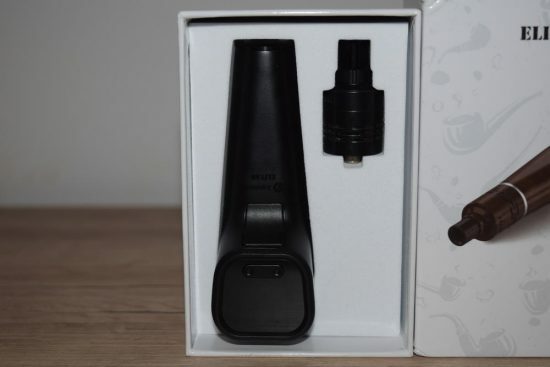 Underneath the holder is another compartment that contains two Joyetech coil-heads, one for direct lung vaping and another for mouth-to-lung, a USB charging cable and a user manual. Design-wise, the Elitar is a thing of beauty! 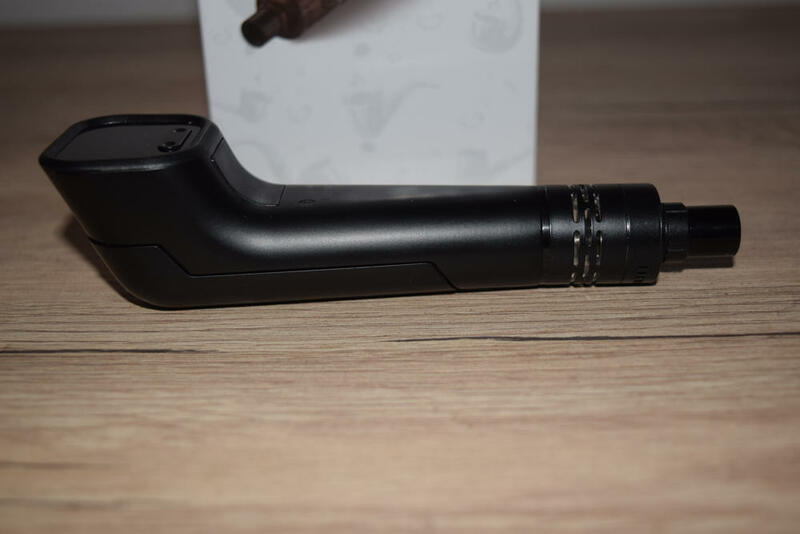 It’s hard for me to describe just how cool this thing looks, and how nice it feels in the hand, but I can say that Joyetech have taken that classic tobacco pipe shape and given it a modern makeover to create one of the most visually-appealing vaporizers on the market today. I for one am a big fan of the end result and I have a feeling that people are going to love it as well. 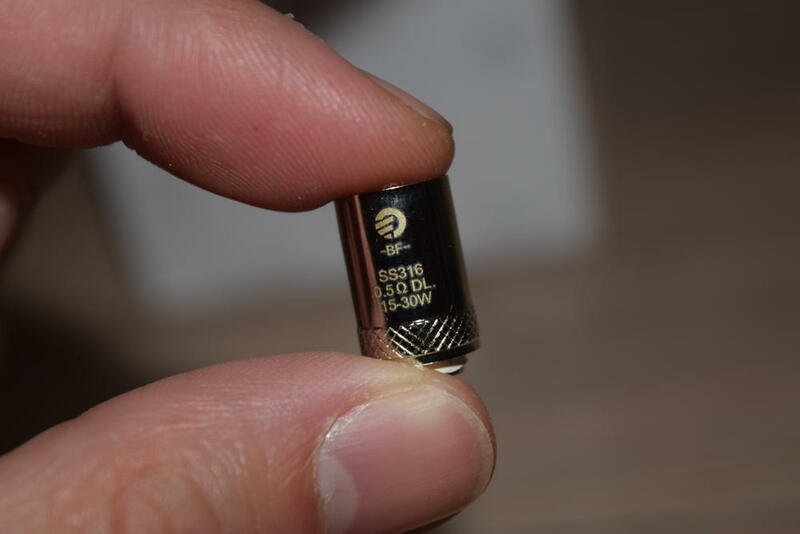 On the narrow end, the Joyetech Elitar 75 measures 22 mm in diameter, which means that as long as you pair it with a 22 mm atomizer it will look great, but anything over that, like a 24 or 25 mm tank will have noticeable overhang. 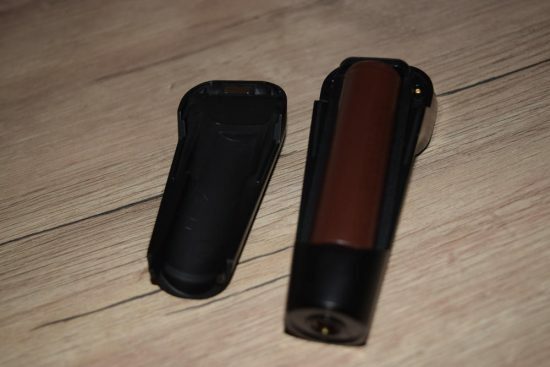 And while I don’t really mind that on a box mod, the size difference looks way worse on an e-pipe. On the bulkier end of the pipe, the classic tobacco chamber has been replaced with a bright LED screen and two menu navigation buttons. 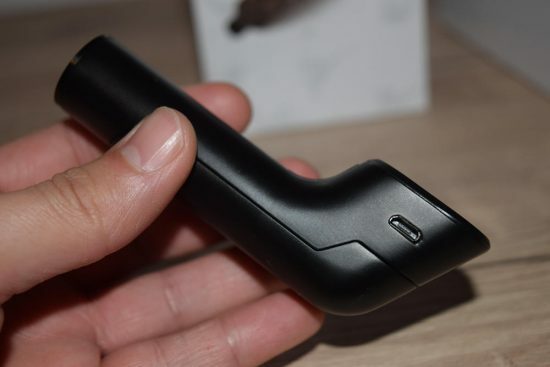 And whereas this part of the pipe is usually round, Joyetech went for a square shape with rounded corners. It may sound weird, but it actually looks pretty cool. To use the Elitar e-pipe, you have to press a large fire button located on the front of the device, right under the display. You can press it however you want, but for that authentic pipe puffing experience, I suggest using your thumb. 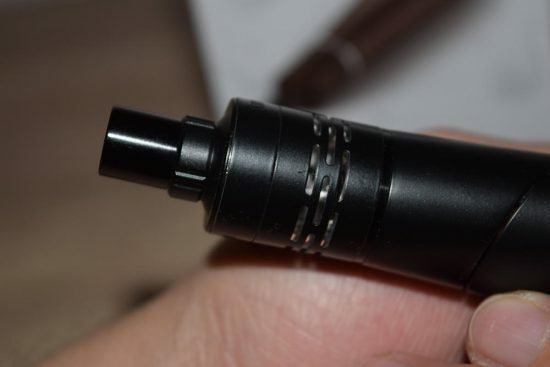 Basically, you just wrap your fingers around the large end of the Elitar for support, and use the thumb to press the button when you vape. The positioning is great, as far as I am concerned, and the button itself is very easy to press, maybe a little too much so. The problem is that it’s way too sensitive. The tiniest amount of pressure applied to this button activates the battery, and that has led to a number of accidental firings during the three days I’ve had it for. It’s not a big deal, and you get used to it after a while, but I think they could have made the button a bit stiffer to prevent this from happening. The only real problem I’ve had with the Elitar was getting the battery cover to close properly. Joyetech’s e-pipe is powered by a removable 18650 battery – not included in the kit – which goes into a compartment on the back of the device. To gain access to this compartment you have to remove the magnetic battery cover, which is easily done by pulling on it with your fingernail. Th though part is closing the battery door after inserting the battery. I first tried it with an Aspire 2500 mAh battery and it worked ok-ish. I thought that the seems between the door and the e-pipe were a bit wider than before, but it didn’t bother me. Then, when I tried using the Elitar with an LG HG2 300 mAh battery, I couldn’t get the door to close at all. 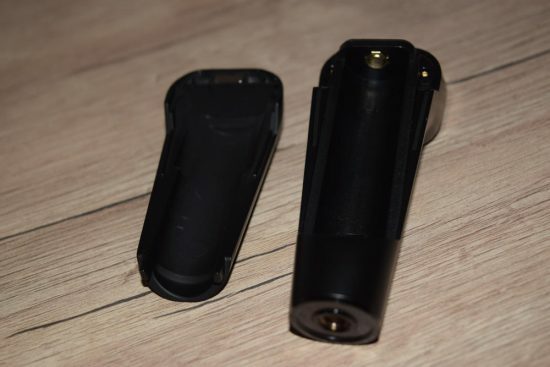 After going online to see if anyone else had experienced the same issue, I found that it is a known problem which Joyetech has promised to resolve before the Elitar 75 hits the market. I really hope they address this problem soon because right now the device is pretty much unusable with most batteries, unless you’re willing to vape on it with the battery fully exposed. 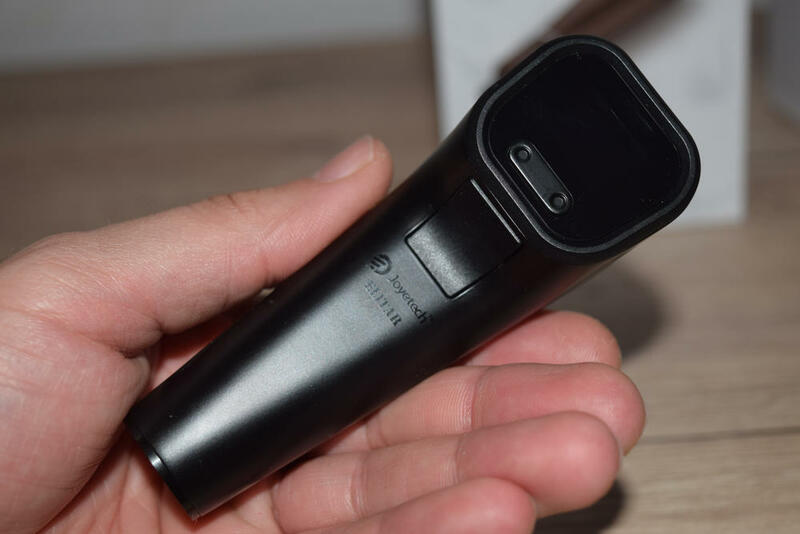 The Elitar 75 features the same seemingly simplistic menu system as other Joyetech devices we’ve seen in the past, like the eGrip 2 or the Joyetech Cuboid. If you’re used to it already, navigating the Elitar’s menu will probably be very easy, but this is your first time fiddling with an advanced Joyetech device, get ready for a dose of free frustration. 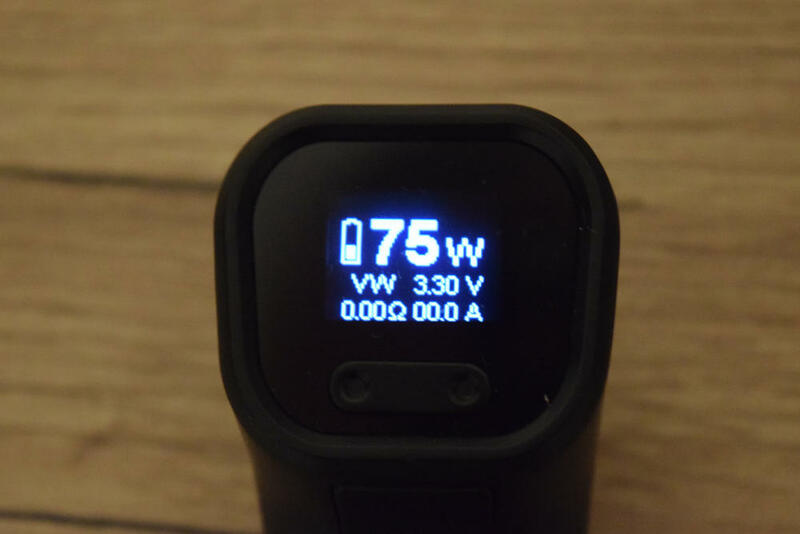 So here’s the deal – the Joyetech Elitar 75 doesn’t really have a menu to go into, like SMOK or iJoy devices, for example. You simply have to use the two adjustment buttons on the display – we’ll call them ‘left’ and ‘right’ – to make changes directly on the home screen. To access the “menu”, you start by pressing the fire button three times in rapid succession. Once you’ve done that, you’ll notice that the symbol for wattage mode or temperature mode -depending which one you’re using – starts to blink. Now it’s time to use those adjustment buttons. The most important thing you have to remember is that ‘left’ lets you browse through the settings, while ‘right’ actually changes the setting you’re hovering over. Sound easy enough, right? It’s not, believe me. I’ll give you an example. Let’s say you want to switch from wattage mode to temp control mode. You press the fire button three times, the ‘VW’ symbol starts to blink. There’s no need to press the ‘left’ button, as this is the setting you want to adjust. So you press ‘right’ once, and it goes into temperature control (press it again and you go into bypass mode, which lets you use the device like a mech mod). But then you notice that the display says ‘TCNI’, which is the temp control setting for nickel. You have a stainless steel coil, so you have to set it to ‘SS’. So while the TCNI symbol is blinking, you have to press the ‘left’ key to jump to material selection. You’ll see only the ‘NI’ symbol blinking now, so you have to press the ‘right’ button to browse through the supported materials until you find stainless steel. To exit the menu, just press the fire button again or wait for 10 seconds for the blinking to stop. And it’s like this with pretty much all the settings. The problem is that pressing the wrong key at any given point will confuse you completely, and you’ll have to start over. As much as I hate convoluted menu systems, I think this apparently simple menu is the most frustrating I have ever used. As I mentioned, you’ll get used to it, it’s definitely not a deal breaker, but I really wise Joyetech would change it. 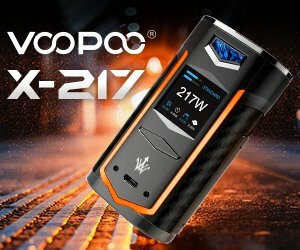 If they really want something simple, they should really take some cues from iJoy, their menu is probably the most user-friendly I’ve seen. Anyway, once you get the hang of this quirky menu, you’ll discover that the Elitar e-pipe has a wide range of features. 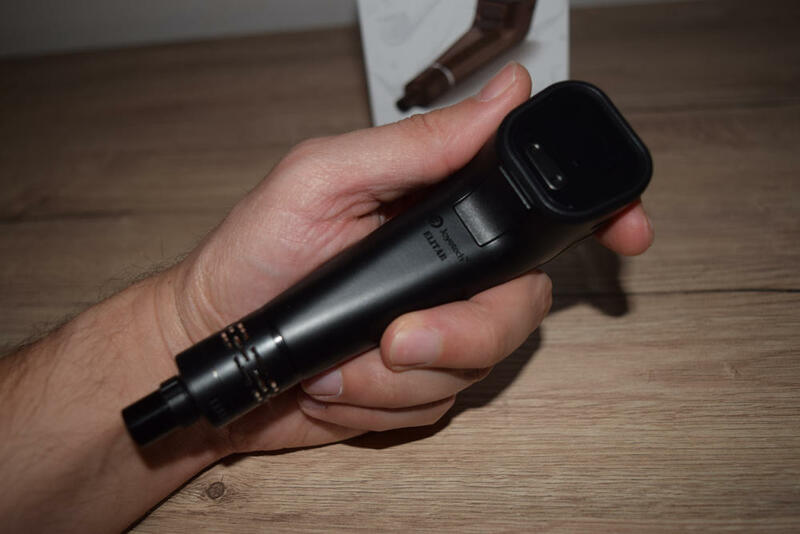 Apart from operating in four different modes – wattage mode, temp. 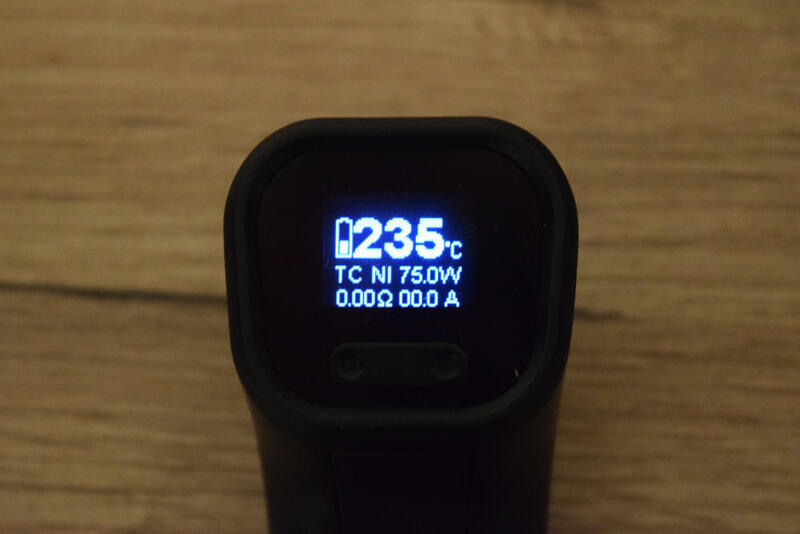 control (nickel, titanium and stainless steel) memory mode, and bypass mode – it also features TCR for temperature control as well as a way to lock the atomizer resistance of the atomizer and adjust the wattage in TC mode. By scrolling to the amperage symbol on the display, you can also change it to display a puff counter or a puff timer instead. The memory mode is one of the coolest features of the Elitar, allowing you to save the TCR for up to three different temp control materials, so you don’t have to make adjustments every time you switch. 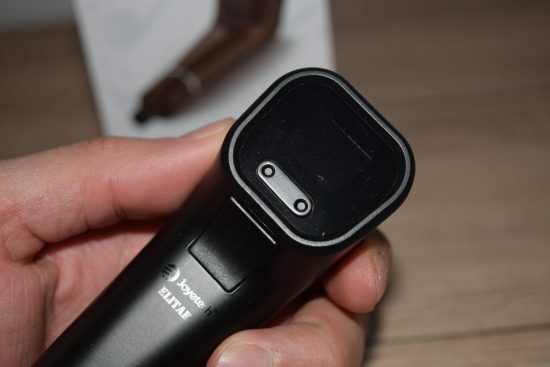 To adjust one of the memory modes, first turn off the device by pressing the firing button five times in rapid succession, then keep the firing button and the ‘right’ button pressed for about five seconds. You’ll see M1, M2 and M3 show up on screen, and you can use the ‘left’ and ‘right’ keys to input the TCR for each of them. The display of the Elitar is not the nicest I’ve ever seen, but it fulfills its purpose. 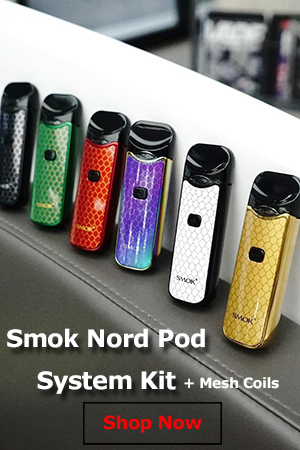 The screen is bright enough to see in bright sunlight – not as bright as the new SMOK displays, though – and the symbols are large enough to see even if you don’t have 20/20 vision. The display features a battery life indicator, the current wattage or temperature depending on what mode you are in, the atomizer resistance, real-time voltage for wattage mode/wattage for temp. control and the amperage/puff counter/puff timer. The Joyetech Elitar 75 comes with a 2 ml tank that supports the same time of coils we’ve seen on the Joyetech Cubis and the eGo AIO. 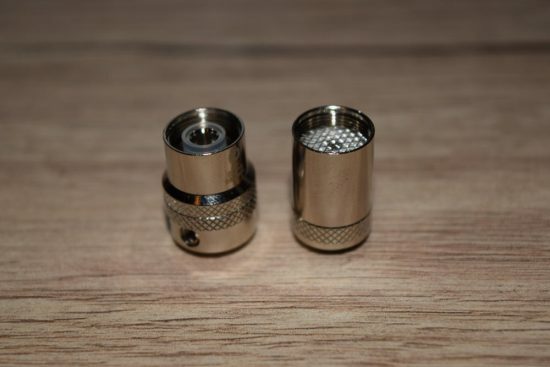 I’ve heard a lot of people complain abut these coil heads, but I happen to think that for their size – these things are tiny – they are amazing. 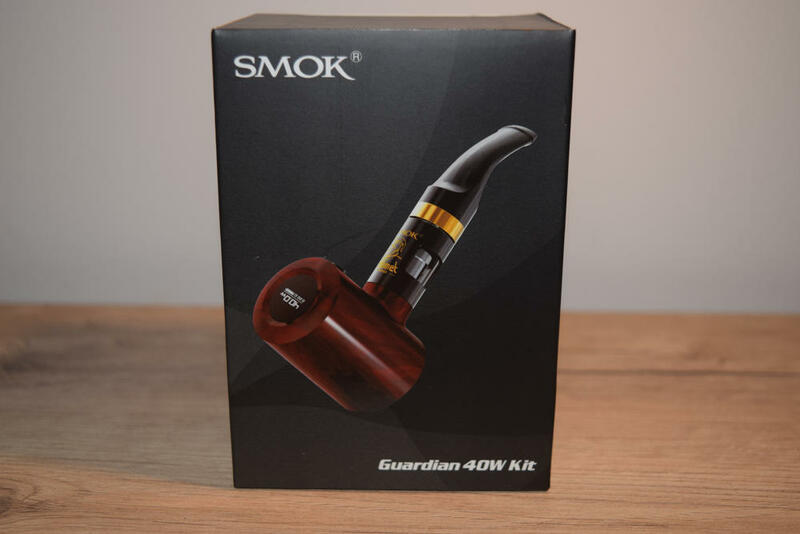 In the kit, you get a 0.5Ω coil head for direct lung vaping, and a 1.5Ω one for mouth-to-lung (MTL). But if you feel like experimenting, Joyetech has a wide range of compatible coils available as a separate purchase. Different resistance, different coil styles, different materials, you name it, they have it. The Elitar tank has the same innovative cup-design as the Cubis, meaning that you will not have any problems with leaking. But while it may be leak-proof, this type of tank is prone to producing spit-back, since there’s nowhere else for excess juice to go, but into your mouth. You should be particularly careful not to flood the coil head when getting ready for use. 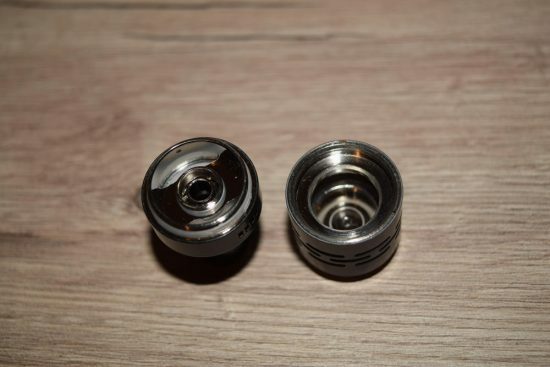 Joyetech recommends dripping a few drops of e-liquid into the coil to saturate the cotton and prevent dry hits, but more than a couple of drops increase the risk of flooding, so don’t overdo it. The tank also has a top filling system, which can be accessed by grabbing the bottom of the stainless steel drip tip and unscrewing it. Then all you have to do is fill it up with juice through one of the massive fill ports. 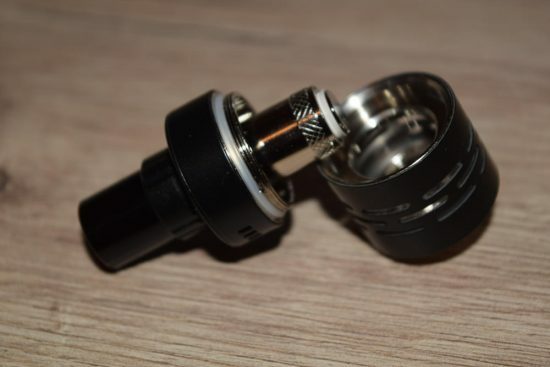 The Elitar tank only has top adjustable airflow, which can be opened or closed by rotating a metallic ring right under the drip tip. Since I don’t like MTL vaping very much, I have been using the this tank with both airflow slots wide open, for maximum vapor production. 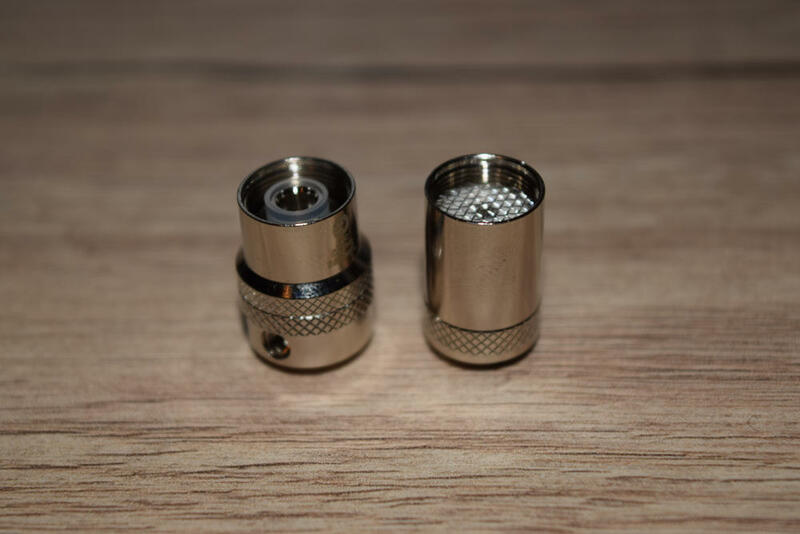 The amount of vapor I have been getting from that tiny 0.5Ω has been nothing short of impressive, but there was one thing that I found annoying – because both airflow slots are made up of five small holes, when they are open completely they make a nasty whistling noise. Closing up two or three of these holes solves the problem, but you can feel the difference in airflow as well. One thing I have mixed feelings about, as far as the Elitar tank is concerned, is the metallic grating around the tank. 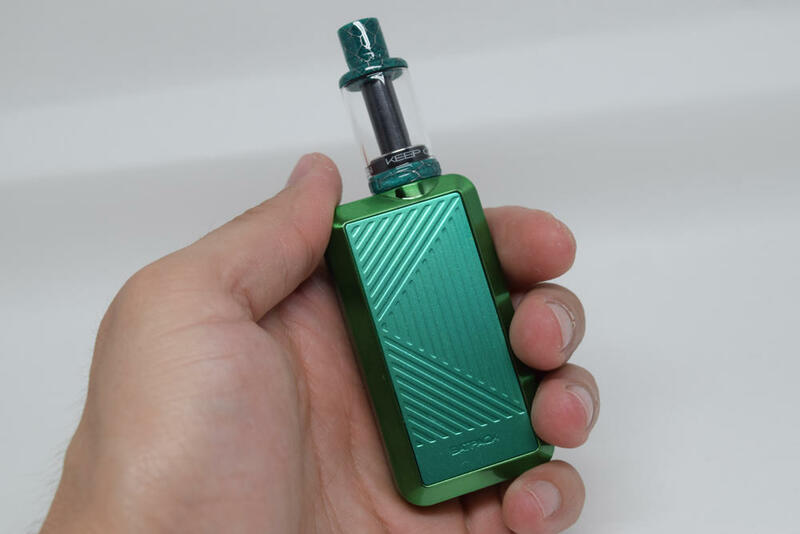 It acts as a protective shield in case you drop it or accidentally bang it on a rough surface, but it also makes it difficult to keep an eye on the e-liquid level inside the tank. It’s a minor problem, though, and protecting the glass is so much more important. Overall, I think this tank is pretty decent.l I can already hear people complaining about the 2ml e-liquid capacity, but the type of coils it uses are usually not particularly thirsty, so unless you’re using a really low resistance, the juice should last you at least a couple of hours. And if you plane on using it for MTL, you really don’t have to worry about juice consumption. Anyway, I’m very happy with the way it performs. The Joyetech Elitar 75 is definitely a very cool-looking device. The form factor is its main draw, so if that’s the main reason you’re interested in buying it, I say go for it. You get pretty much all the nice features of an advanced mod, and decent power output. Let’s be honest, the majority of vapers hardly ever go over 60W, so a maximum output of 75W is more than you can ask for from a slick, elegant e-pipe. The menu takes some getting used to, and there is that problem with the battery door that needs to get addressed as soon as possible, but otherwise, I can’t say I’ve encountered any major faults while testing this device. Since it comes with the same type of tank and coil heads as most other Joyetech devices these days, you get the same vaping experience as with the eGrip 2 or the Cuboid box mod. So if you like those, you’ll probably love the Elitar as well. This sample was provided by our partners at Heaven Gifts, for the purpose of this review.